May is quickly approaching and we cannot wait to see all of you at our Annual Spring Meeting in just a few short weeks! 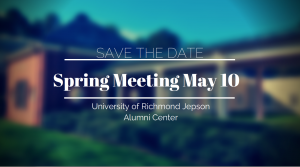 The meeting will be held at the University of Richmond in the Jepson Alumni Center on May 10th from 10:30 to 2:30. Arrive at 10:00 am to get in some extra networking before the meeting begins. Once you get settled in, help make VAEEC the best that it can be by participating in our 2018 Board Elections and, for the first time, a live membership poll that will be conducted via text message! The poll will consist of no more than five questions with multiple choice and write-in answers. Let VAEEC know how we can better serve you! Our breakout sessions this year will focus on Commercial Building Automation and Residential Utility Programs. The commercial panel will offer participants a chance to interact with panelists to learn more about commercial building automation and to overcome existing challenges with their building automation systems. 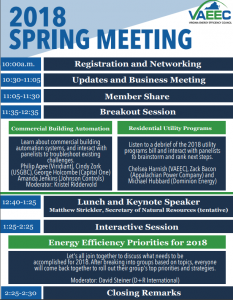 Staff from Dominion Energy and Appalachian Power Company will be on the utility panel to discuss how they plan to turn their commitments to energy efficiency- in the new utility spending bill that the Governor signed into law last month- into reality. 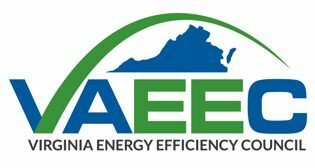 Join either group to brainstorm how energy efficiency can grow even further in Virginia. During lunch, we will be joined by the Secretary or Deputy Secretary of Natural Resources to lay out the Governor’s vision and priorities for energy efficiency over the next four years. This will be a great opportunity for us to connect with the new administration on our work. Our final panel of the day will be a fun, interactive session that provides you with the opportunity to shape VAEEC’s work for the remainder of the year. After a brief overview, attendees will join one of four breakout groups to discuss a variety of issues: Residential programs, Local Government activities, Utility Program expansion or Commercial PACE. We can’t wait to see what you all come up with. One of the many benefits of being a member of VAEEC is having your chance to shine! Share your success story during the Member Share portion of our event. Email Jenn Fisher, our new Administrative Assistant, at info@vaeec.org to sign up in advance. New this year, we are also providing our members with the opportunity to leave out their business cards and marketing materials on our Member Networking table. In order to accommodate all materials, we are asking our members to email your information to info@vaeec.org by May 7th at 5pm. 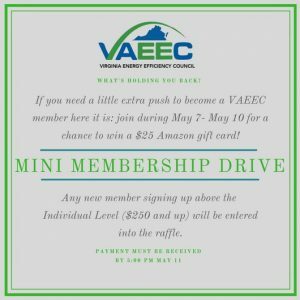 If you are not yet a member but want to take advantage of this and the other great benefits that come with a VAEEC membership, the week of the Spring Meeting is the best week to join! Join at any membership level above Individual between May 7th and May 10th, and your name will be entered to win a $25 Amazon gift card! Hurry up and register today! Registration closes next Monday, April 30th. For members, media, or speakers please use this link to register. 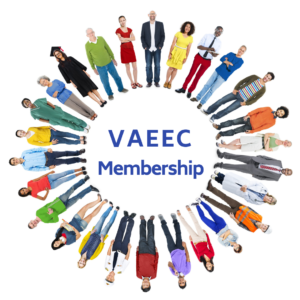 If you are not yet a member of VAEEC, please register here. We look forward to seeing you on May 10th!